You may notice that she’s made a couple of changes to her hair since my last post. 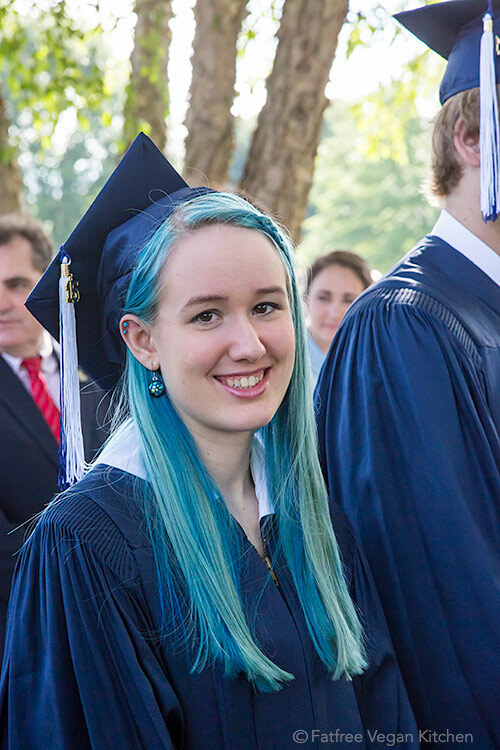 I’m so proud of my beautiful blue-haired math genius, and though I know I’m going to be depressed when she leaves for college, I was happy to see the end of a very busy and stressful senior year. In addition to taking 5 AP classes, 2 regular classes, and band, E had to take time out to visit colleges and then make a very tough decision. When she narrowed her choices down to two, she agonized over whether to choose the one that she had enjoyed the most during her visit or the one with the academic program she liked best. It was a classic heart vs. head choice, but in the end she chose the one with the more compatible curriculum. It didn’t hurt that it has a dining hall that really caters to vegans with a dedicated vegan section and a vegan dessert every day. I don’t think E wants me to make it public exactly where she’ll be, so suffice it to say that in the fall, she’ll be at a great liberal arts college in the Midwest. One thing my husband D and I have enjoyed during this whole college decision process is checking out each school’s menus online and seeing how vegan-friendly they are. All of the schools that E considered were vegan friendly, but some had more creative menus than others. D was particularly fond of Lawrence University because of the wacky combinations on its Vegan Pizza of the Week (right now it’s vegan Bahn Mi Pizza, which doesn’t sound too far out) and its vegan takes on international dishes. Though E ultimately choose another school, I have Lawrence to thank for introducing me to vegetarian Lomo Saltado. I had never heard of it, so when I saw it on their menu, I turned to Google to educate me. 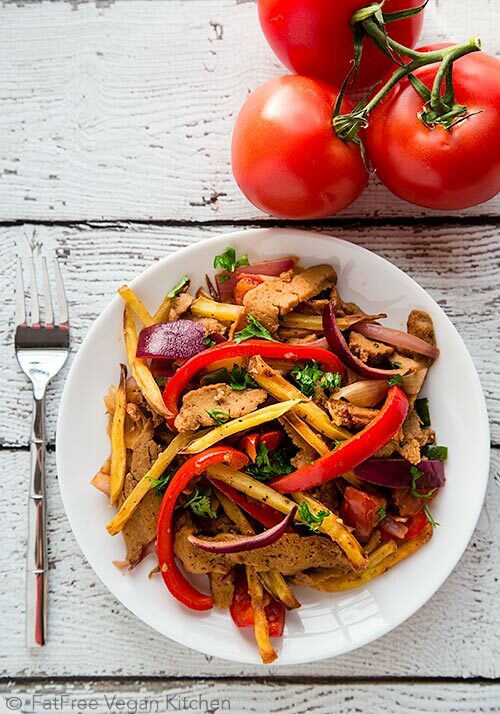 Lomo Saltado is a Peruvian dish that combines strips of beef with fried potatoes in a stir-fry. (“Lomo” means loin and “saltado” means sauté.) It’s a fusion of Chinese and Peruvian dishes that has become part of the mainstream cuisine in Peru. In my vegan version, I made a very simple substitution of packaged seitan for the traditional tenderloin, and I baked my French fries rather than frying them. Normally, the dish would include yellow peppers called aji amarillo, which are very difficult to find in my neighborhood, so I used one red bell pepper for volume and a jalapeño for heat. It was simple, delicious, and, with the potatoes and brown rice, very filling. We ate it with Sriracha for a little added zing. Cut down on the amount of time this recipe takes by prepping the vegetables and assembling ingredients after you’ve put the French fries in the oven. Note: Packaged seitan may contain soy products and added fat; use homemade seitan to eliminate these ingredients. Preheat oven to 400F. Line a baking sheet with parchment paper. Cut the potatoes into French fries, whatever size you like. (I used my mandolin to make skinny fries about 1/4-inch thick.) Sprinkle the fries with salt and pepper and spread in a single layer on the baking sheet. Bake, turning every 10-15 minutes, until fries are browning and becoming crispy, about 40 minutes depending on the size of your fries. Keep warm. While the fries are cooking, combine the seitan in a large bowl with the cumin, garlic, and a generous grinding of black pepper. Allow to marinate briefly while you prepare the other ingredients. When the fries are almost done, heat a large non-stick wok or skillet. Sauté the red onion until it begins to soften, about 2 minutes. Add the bell and jalapeño peppers and cook another two minutes. Add the seitan and chopped tomato and cook, stirring, until hot throughout. Stir in the vinegar and soy sauce and gently fold in the French fries and parsley. Serve alone or over rice with hot sauce on the side. This looks beautiful! I would like to make my own seitan like you suggested, but which of your recipes would you recommend for that? Thanks in advance! Marianne, I’ve thought about it, and I don’t think I have a standard seitan recipe. I must rectify that! I’ve used recipes from Bryanna Clark Grogan in the past, and they’ve come out well. Congratulations to E (she looks adorable) and wishing her the very best in her new journey!! My “E” just graduated from college, I missed her terribly the first year but it was tempered by the excitement of watching her evolve into an amazing young woman. All best to you and your family during this transition. This is an absolutely stunning photo and a recipe I will definitely try. Welcome back Susan and big congrats to E, you and husband on the graduation and college enrollment. Best of luck. Please advise your best homemade Seitan recipe. Thanks. when I went there half a century ago (nothing was) and I’m glad I found out through you that it now does accomodate vegans! Congrats to E!! Thats amazing! This looks delicious too! E looks gorgeous! Those hair colors look just beautiful on her… makes me think of mermaids. 🙂 Congratulations to her for her stellar performance in high school, as well for making a difficult decision on colleges. How heartening it is to see campuses around the country offering vegan fare! It’s E and her generation that will really turn things around for animals and the world, I think. Brava, E!! Congratulations to E! And thank you for another wonderful recipe. I can’t wait to try it this weekend. I’ve been vegan for a little over two years now and you helped make the transition an easy one. I’m so grateful! I loved this post, Susan! It does sound like fun to investigate vegan menus on college campuses. Since seitan is out for me, I am thinking that sliced portobello mushrooms might make a good substitute. Not exactly the same texture, but a “meaty” texture nonetheless. Congratulations to E – parents too. I have made the southern banana pudding many times – favorite of my grandchildren. Always enjoy the picture of E making it – how quickly the years pass. Hi Neyla. “Lomo saltado” is definitely correct as Susan has written it. Peruvians use both /saltear/ and /saltar/. /Saltar/ refers to the method of tossing food off the bottom of a pan (making it jump, or saltar, like you mentioned) by using the pan handle and a certain flick of the wrist. It comes from Chinese-Peruvian cooking and is very impressive to see when a professional is making a big batch of tallarín saltado! 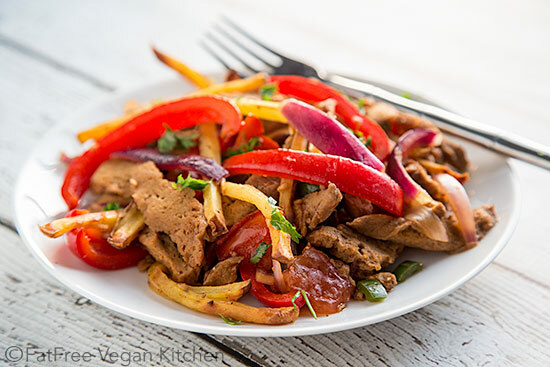 Susan, your seitan saltado looks gorgeous! How exciting that colleges are broadening their veg offerings. Coincidentally, i just had my Peruvian cookbooks out the other day to share with my foodie coworker and had been thinking about making a seitan saltado myself. I lived in Peru for a while back in 2003 and enjoyed the food so much, and i am thrilled to say that there is a vegan movement in Lima today. Congratulations to you all and best wishes to E on her transition to college life! If you use the Westsoy seitan, do you drain it first? This is dinner tonight. Thanks, Shellie! yes, drain the liquid from the seitan first. Next time. I drained some this time. Potatoes are done, onions are cooking. The smells in here are incredible. Thanks again. Absolutely delicious dish, Susan. We loved it. A definite keeper. Thanks. I’m so glad to hear that, Shellie! This looks like a perfect recipe. 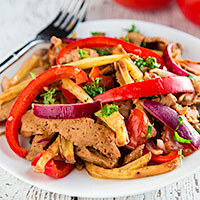 I really like the idea of incorporating potato wedges into a veggie stir-fry! Congrats to your daughter! And it’s great to hear that there are more vegan friendly colleges out there! I met you at Vida Vegan Con (at the registration table) in Austin last week. This recipe looks awesome and I can’t wait to try it. I just want to thank you so much for all your great ideas and awesome recipes. You helped make my transition from vegetarian to vegan so easy. And I really appreciate you doing so many recipes that are lower in fat. This looks so beautiful! I think, I would make this with tofu! loving the peruvian flavors! And Susan, thanks for this recipe; it’s simple and yummy! One of those make-it-once and then don’t need a recipe for the second go-round. Your daughter is gorgeous! I love the hair. Congratulations to her and you! It’s been a while since I visited the site, so accept my belated congratulations to E–and to you and your husband! Junior and senior years of high school are so intense these days. She’s (and you’ve!) made it through and landed in a good place for her, it seems. Yay! It’s funny, a few weeks back one of my students (I teach 8th grade Algebra.) came to school one day so very excited about a trip she and her granddad had made to a Peruvian restaurant. This girl, a swimmer who burns through calories left and right, loves her food in general, but she she couldn’t stop raving about that food, the leftovers of which she brought for lunch (I remember it was kind of like what you have here, except she had steak and deep fried potatoes, and of course the rice). As she was talking about it, I thought that I’d never had Peruvian food, vegan or otherwise, and when school was out for summer I was going to look for a recipe. Well, I don’t have to look any further; you’ve got me covered! The spices and flavor combination seem yummy and the recipe as a whole looks simple to but together, even if I did make my own seitan. I’m gonna try this soon! Susan, big congratulations to you and your family! And many thanks for sharing your talents with us. Looks very hearty and tasty, thanks! Congrats to E and I love the blue hair! This is such a great, easy recipe, I made it twice in one week! Served over quinoa instead of potatoes. Also replaced tomato once with sun dried tomatoes (rehydrated). Didn’t have a jalapeño, so used red pepper flakes. Thank you Susan! I just made this for dinner and it was delicious. I’ll make this again, soon! Thanks for the great recipe and best of luck to E.
Lomo Saltado has ají amarillo for heat and flavor, it’s not necessary to replace with yellow or red or any color pepper. Ahí amarilla is a hot pepper like jalapeño but not the same at all. It’s a suitable alternative for folks who are not pervuvian and have no idea what to expect.